This is a very different climate for brands to compete in. Companies are beginning to realize that consumers are more important for the success of a brand than they ever used to be. Reaching out to people in the traditional way - a controlled message delivered through controlled channels - is processed by people as marketing, which is disconnected from the lives of the very people they are trying to influence. These companies realize that a brand is no longer a fixed idea to be imposed, the way old-world brand management decreed. A brand is a dynamic entity, an idea that is more powerful and compelling when there is space and room for their users to integrate it into their lives. Such integration does not come lightly: it is only when people are motivated, not only to engage but to participate. Such participation is vital if brands are to sustain the energy in the lives and minds of people outside of the limited places and times a company can pay for brand communication or promotion. One might think this task is made easier by the co-creation phenomenon, examples of which can be witnessed all over the web and which is the content engine of Youtube. But look at how little content on Youtube is branded content, and when it is, it's static content that is being distributed virally, not an example of how the brand is integrating into the lives of its audience, other than through an entertainment channel. The W is a great example of a company that understands how to deepen involvement and integrate the brand more richly into people's lives. While it's primarily a hotel, OFD believes that the heart of its business and W brand is setting the stage for possibilities to occur. The W understands that people value this quality in their lives, and the places they spend time. The more enlightened companies realize it is understanding where people derive value in the context of their individual and social lives that is an effective way to orient and deliver brands encounters for deeper integration. Setting the stage for unlocking possibilities is an approach that separates the W from all other hotels. Success relies however on the very thing that it cannot control: how people interact. What it can do is shape what can happen through the power of suggestion and curating a supportive environment. 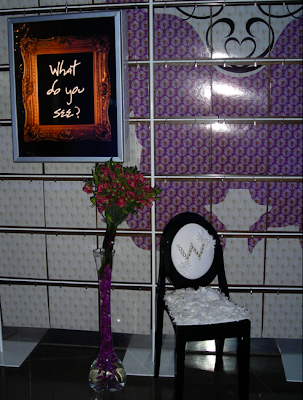 Lobby of the W hotel in Dallas: "What do you see?" Inviting participation heightens the senses and inspires people to construct their own subjective experience. There is no single reality, we each craft our own version from how we interact with what's around us. This impressionistic atmosphere has been deliberately cultivated; where there aren't the rules one feels silently in play at other hotels, where the imagination is sparked by what is seen and what is interpreted. It is a beckoning open door, one that ignites a sense of possibility that is at the heart of the brand's distinctive allure.